How Non-Laser Permanent Makeup Removal work? If you are desperately waiting for a day to get rid of your bad PMU or tattoos here is the right place! Our non-laser removal method is the best and safest way to remove everything you are not satisfied with. After the procedure and for as long as you have the scab on the skin, keep the treated area dry. 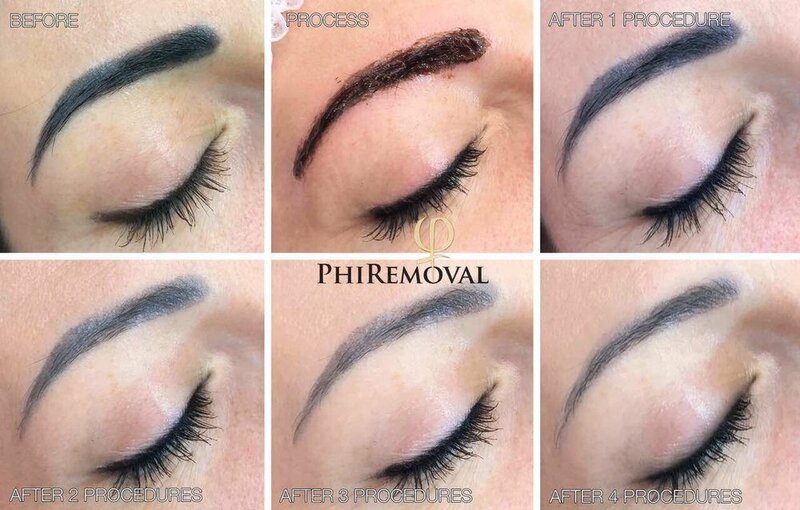 Removal of the tattoo or bad PMU doesn’t end after one treatment. It takes more than one procedure to remove everything you are not satisfied with, but the first results are immediately visible. If only the epidermis is affected, usually there are no traces or scars because the base layer cells of the epidermis are able to regenerate completely. there is no long term post procedural redness or atrophic structure. Please read through the FAQs, BEFORE & AFTERCARE, TERMS & CONDITIONS pages prior to setting your appointment to ensure that you are an ideal candidate for permanent makeup or permanent makeup removal. Results varies from client-to-client and lifestyles. How the skin will react is different for everyone and many factors are to be taken into consideration. Skin type, age, scarring, diet, stress levels, facial products used, etc. all play a key role in how the pigment will hold, which is why it is important to know that more than one procedure may be required. We can guarantee that your face is important to us and that we will act in accordance with our experience and expertise to give you our absolute best. We can guarantee that we will strive to make you content every time. But there are no guarantees in this industry. Please think long and hard before you decide to go for it.